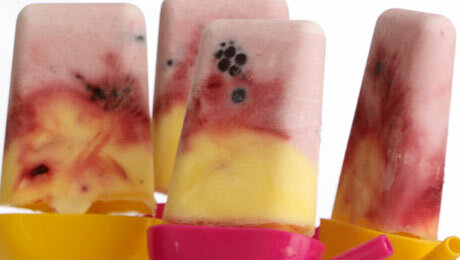 You can use any combination of fruit you like or have in the house. Spoon the puréed peaches and raspberries into two separate bowls. Divide the yoghurt between the 2 bowls and swirl through. Fill ice-moulds with alternating layers of the two mixtures. Freeze the ices for 3–4 hours or until firm. To remove the ices from the moulds, dip quickly into hot water.